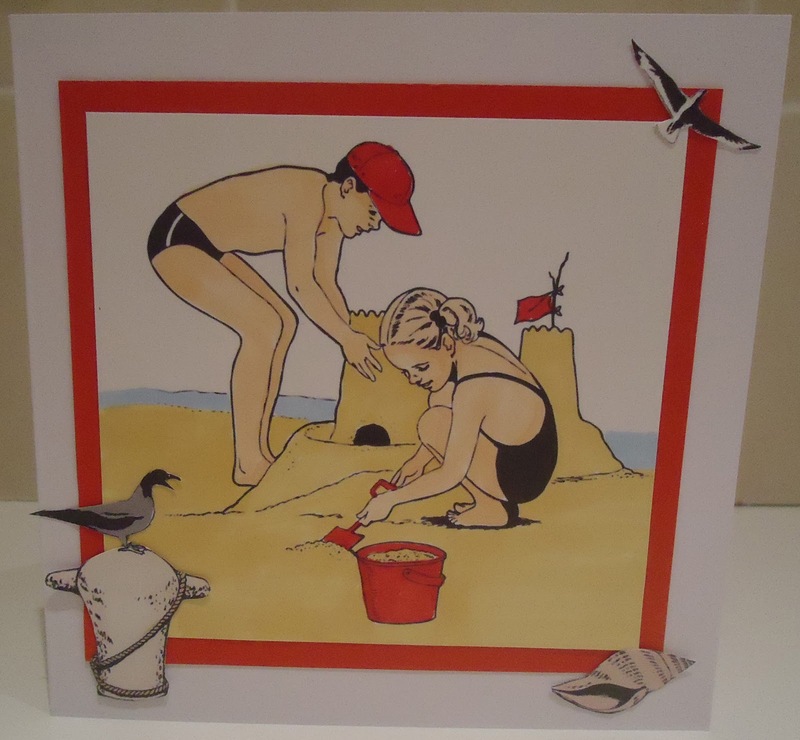 I'm lucky enough to have lots of men in the family to make cards for, so I thought I'd take part in the CD Sunday challenge 'Mainly Men'. 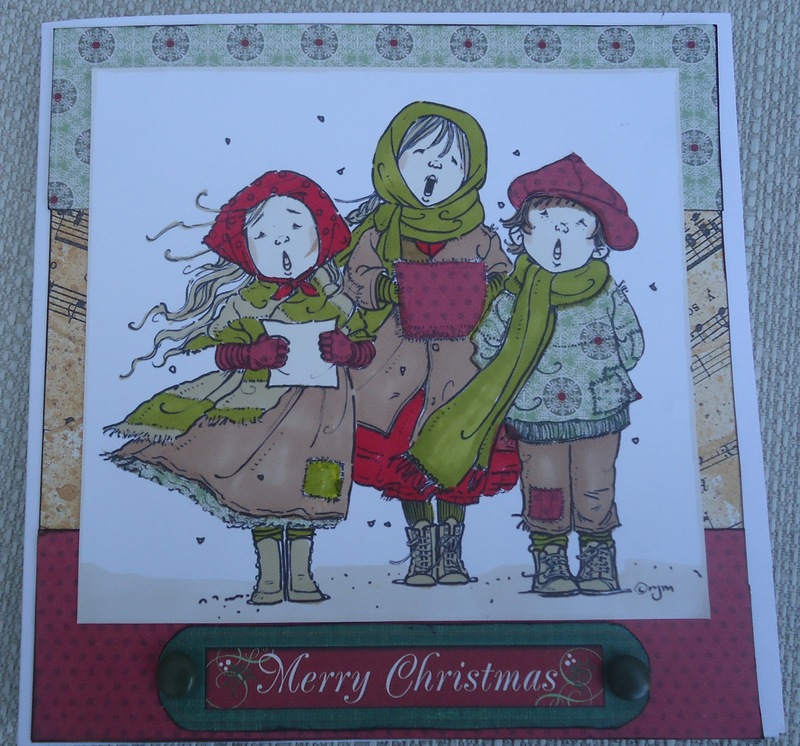 I was browsing my new Docrafts Tulip and Friends CD and came across these images which I thought would be ideal. Then I remembered that somewhere I had a decoupage sheet from a goody bag and, when I found it, realised I had the image already there! So, the background paper and sentiment were printed from the CD but the three layer decoupage was from the pre-printed sheet. 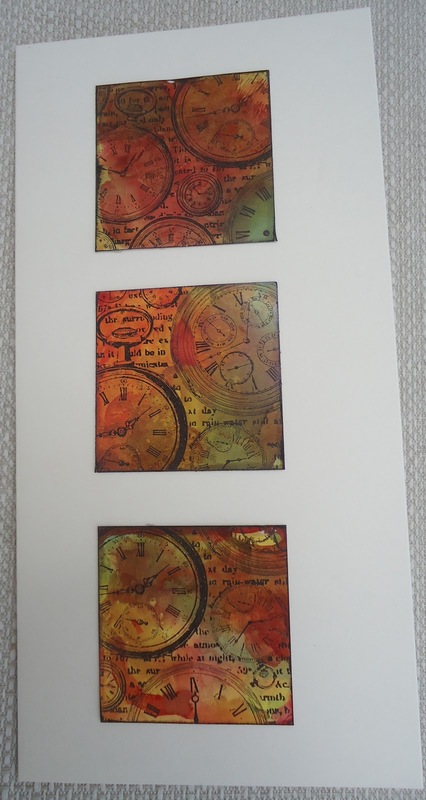 It's nice to know that, if I want to do the same decoupage again, I can just print it from the CD. I generously inked the papers with distress inks and I like the effect that has given. Apparently, there’s a saying – if two women pour from the same teapot, the youngest one will have ginger twins. Well, my mum always had a teapot on the table and I suspect my sister may have made the error, as she does have ginger twins. 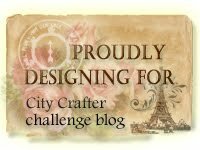 A few weeks ago I set myself a challenge, to use every item in the Docrafts Goody Bag. 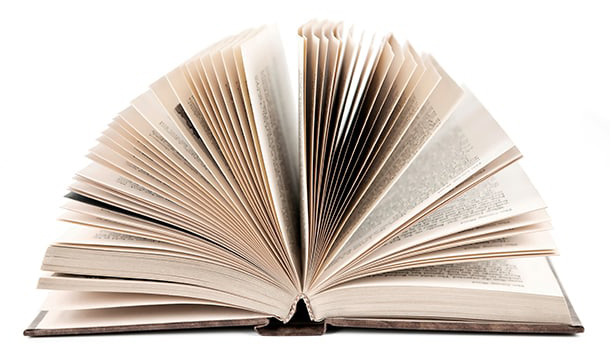 Also see posts here , here, here and here . 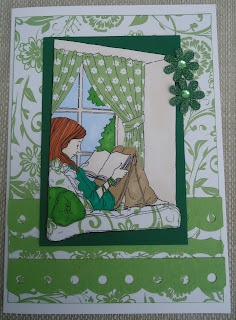 The top card uses several items from the goody bag – the green borders, the patterned paper, the glittery flowers. The image is by Mo’s Digital Pencil. The second card uses a Mo’s Digital Pencil image again, and the Kraft paper from the Goody Bag. 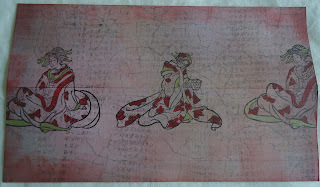 The patterned papers are Basic Grey. So that’s the Docrafts goody bag – done! Late entry for CD Sunday challenge - A is for....., created while watching the Olympics opening ceremony. I use the My Craft Studio CD, A Very Important Date. The Alice legs and skirt were part of a topper, so I cut them out and mounted them on a monochrome background from the CD. 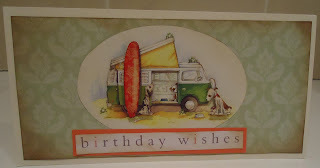 I created the greeting on my pc and punched it out with a Stampin Up punch. I printed the books and cake from the CD and put them on with foam sticky things. I layered it onto white, then black card. I’ve not had much crafty time this week but what little I’ve had has been spent following Fashionable Stamping Challenges' call “Let’s get messy and inky”. This wasn’t my first attempt … you can see a couple of my rejects below. 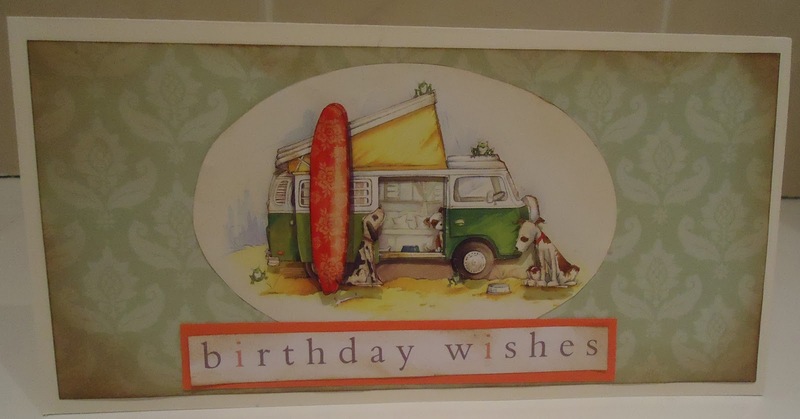 For this card I dug out my Posh Impression inks that, I must confess, are hardly used. They come with a hard sponge and, while it all seemed a good idea at the time, I’ve always found the inks too intense. 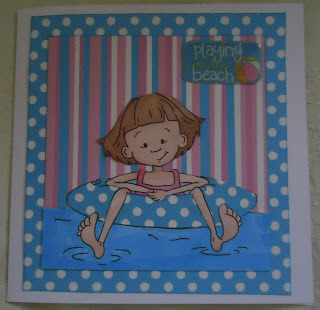 For this background I used 3 Posh inks and slapped them on with a brayer . 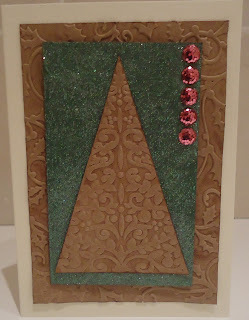 I stamped on top (Kanban) and added silver edging and self-adhesive gems. These are two of my rejects. I really like the sunset one but the silhouette is a bit splodgy – I always have this problem with this particular stamp. 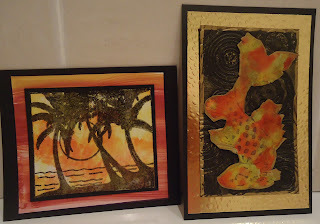 The sunset is made from alcohol inks and the layered background is the Posh inks. 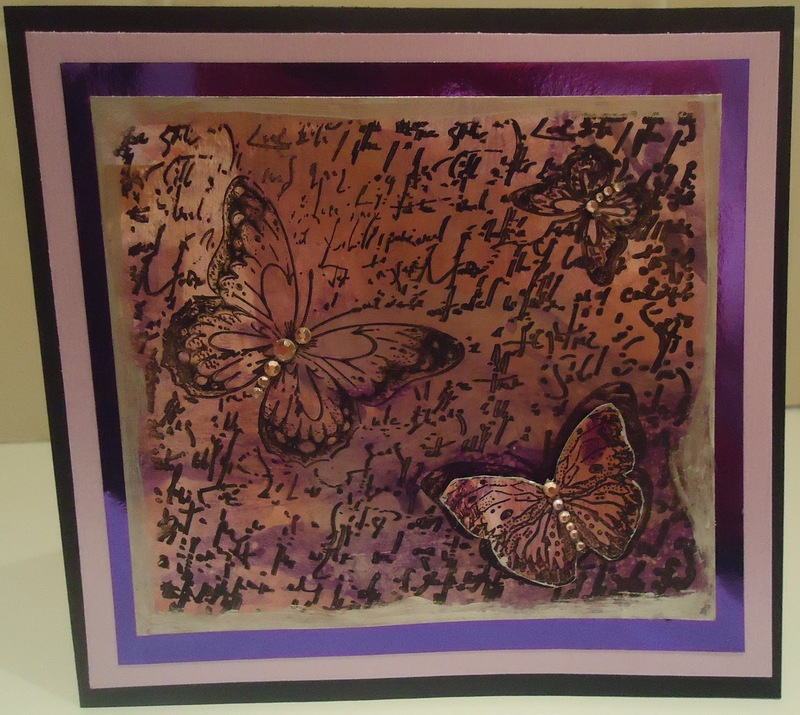 The other card was an attempt at ‘Joseph’s Coat’ technique over alcohol inks. I need to do some more experimenting with this as I didn’t feel there was enough definition on the fish. 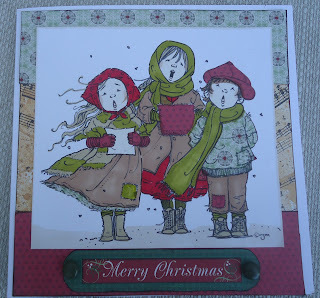 Here’s a simple Christmas card , using kraft paper and embossing folders with distress ink. 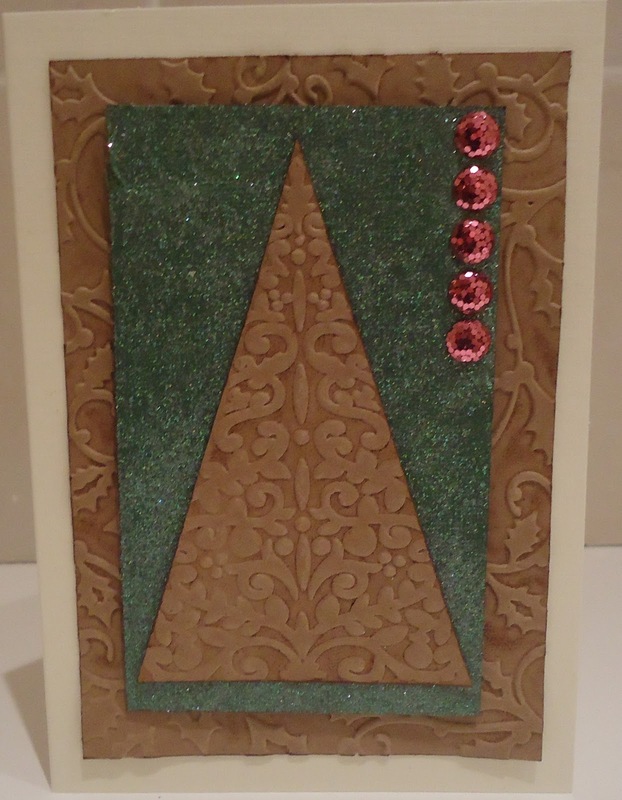 For my self-imposed Docrafts Goody Bag challenge, I’ve used the pink glittery circles and the green glitter paper. The kraft cs was also in the bag, but I previously used some on another project. 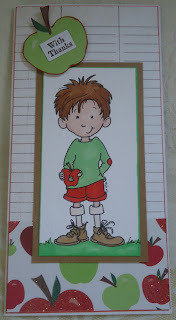 I think this card is quite summer-y – and with his jumper and wellies, he’s properly dressed for summer in the UK! Given that I made this specifically for the Desert Island Crafts Challenge, there are surprisingly few items off the itineray. 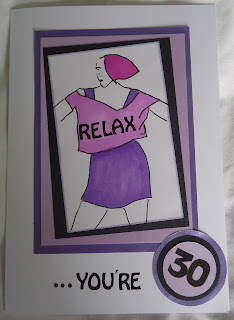 Some people start card-making as a way to save money (and quickly learn to overspend on all that lovely stash). 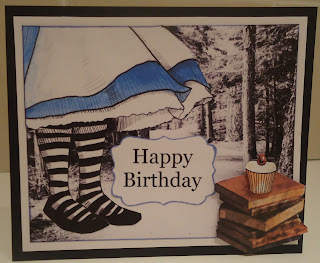 My daughter, however, saves money by getting me to make cards for her! There is usually a very specific requirement and a very short notice period! 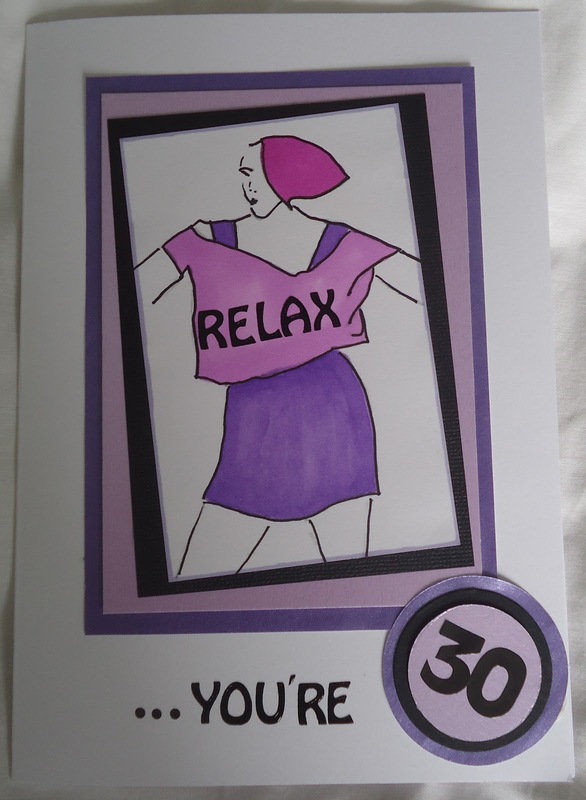 A few days ago, she requested a thirtieth birthday card for someone who’s mad on the 80’s – needed by Saturday! Never mind that I have a full-time job and a five year old child to fit in too. I found an illustration and traced it , coloured it in and added ‘relax’ (a la Frankie Goes to Hollywood) to the Tshirt. While I love my traditional rubber stamps, I must admit that digital stamps come up trumps when you need a particular theme in a hurry. 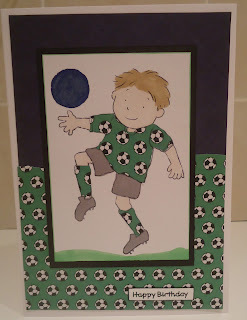 This footballer digi- stamp is by Jellypark, whose stamps I love. 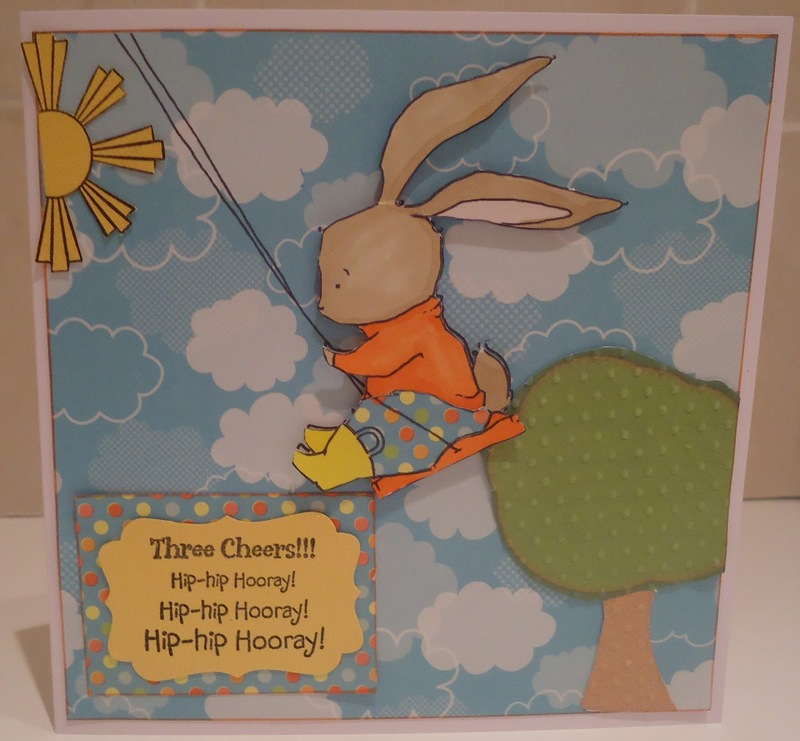 It was my local monthly crop again today and I couldn’t help but use this leftover paper from the class kit on a card. The stamp is by Prickly Pear and the paper is My Mind’s Eye. Hehe – I had to take a day off work as I had an excess day annual leave (no , really) and so I’m hiding in the house crafting. I wanted to join in the Twinchies challenge at Out of a HatCreations and I made these using the clock stamp from the goody bag and alcohol inks. I played around with different backgrounds and embellishments but, as so often, decided I actually prefered it plain and simple. First Christmas card! Will this be the year I avoid the last minute rush? Image is Mo's Digital Pencil. This is the final of the four cards I'm making for my son's teachers/TAs. 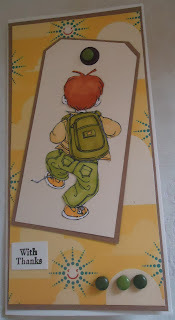 The image is by Sassy Cheryl and I coloured it with Promarkers. 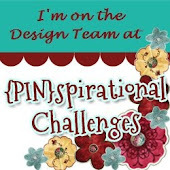 A few days ago I set myself the challenge to use all nine items in the Docrafts Goody Bag. 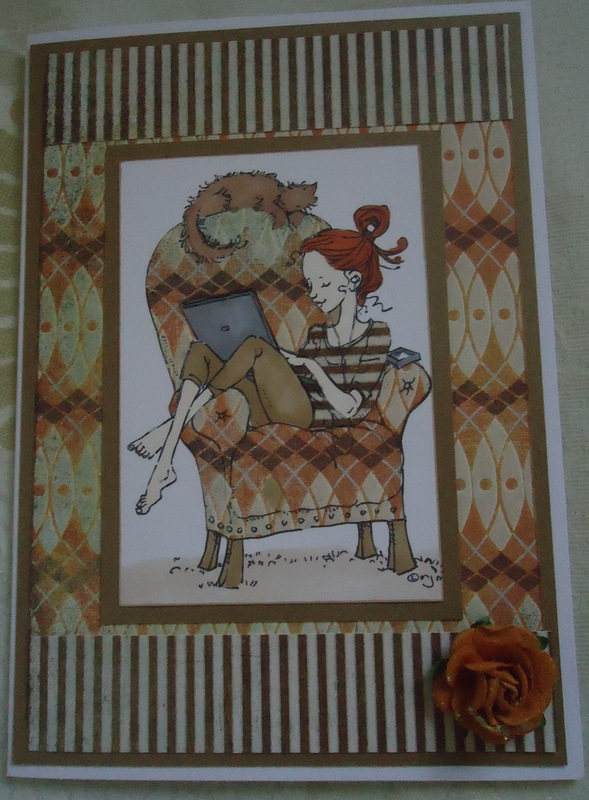 Here I've used some of the kraft card and the lined paper I stamped the sentiment on. "What?? ?That tiny scrap??!" I hear you say! 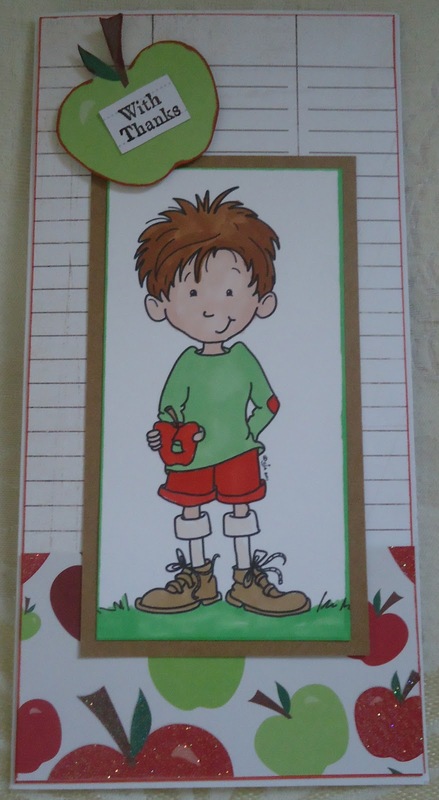 Well, originally I had die-cut an apple out of the journalling cards but I just decided I didn't like it and cut an apple from the patterned paper instead, only leaving a tiny scrap. Hey, I made up this challenge, I can make up the rules!! Anyway, with the paper used on my lst project, that's 3 out of 9 items used. I saw the ‘mode of transport' challenge at Artful Times and could think of so many possibilities that I was stuck for a while. 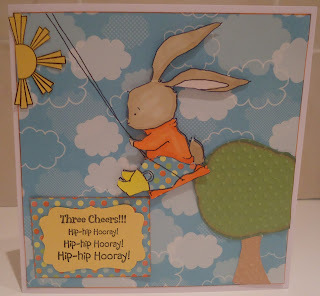 My self-imposed challenge of using up my Docrafts Goody Bag helped me decide on my mode – the rocket. 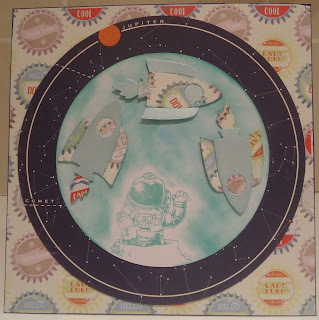 The goody bag contains 1950s style papers and I thought I’d do an (in those days) futuristic space age look card. The spaceman stamp is a single acrylic stamp – I got it at a show, don’t know brand. The rockets are made from a Cuttlbug die (aimed at kids!). The dark circle was cut out from October Afternoon Rocket Age paper. I really had fun making this! Here is the new Docrafts Goody Bag , and once again, I’ll be challenging the My Perfect Life Design Team (still just me, I’m afraid!) to use everything in the bag. This one looks pretty easy, to be honest. There’s lots of nice green stuff , a clock stamp, kraft card, glittery stickers. 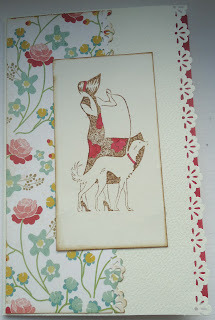 The only one I anticipate finding challenging is the pack of Happy Days (50s style) journalling cards. Anyway, watch this space to see how I do. I can’t wait to show my 5-year-old son this paper lantern. A while ago we saw them made on a video of a 60s children’s show and we had a craze for making them. The house was covered with lanterns. This one is a little more sophisticated ( I hope!). 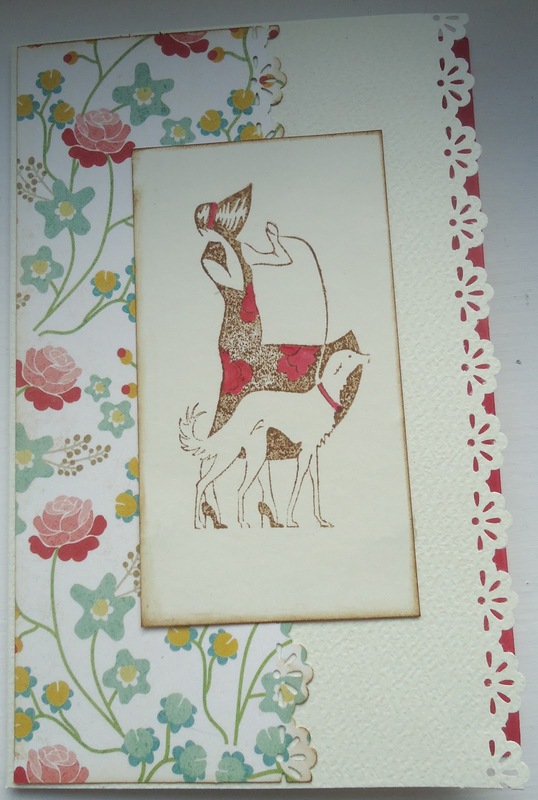 I started with a neutral coloured paper with a crackle pattern and I stamped it with an oriental text stamp (Oyster Stamps). I coloured the back of the paper with Barn Door distress ink and slapped some on the front. I stamped two women ( Non Sequitur) – one I stamped twice (for the join). I partially coloured them in with red and gold. 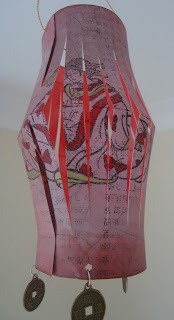 Then I took a photo of my hard work as I suspected I might wreck it when I tried to make it into a lantern! So…I daringly took scissors to my work and made a lantern. I added a handle made from Mitzuhiki cord and oriental charms at the bottom. 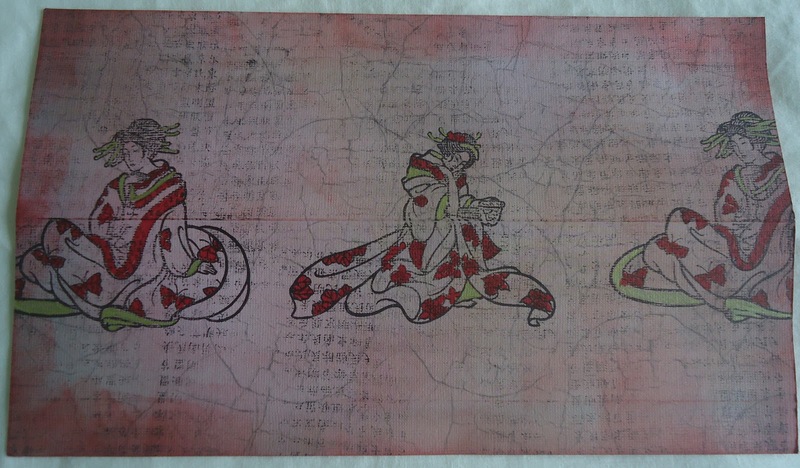 I made this project for the Oriental challenge at Fashionable Stamping Challenges. Maria Von Trapp popped round and made them some play-clothes out of the drapes! 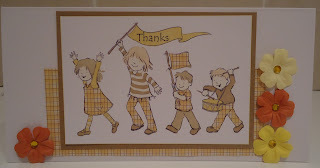 This is a thank you card for one of my son's four teachers. 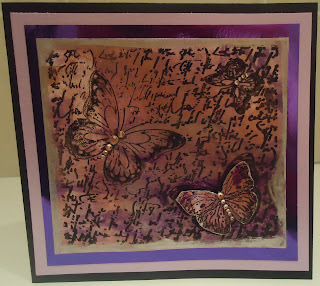 The image is by Jellypark and I used Promarkers and paper from Webster's Pages. 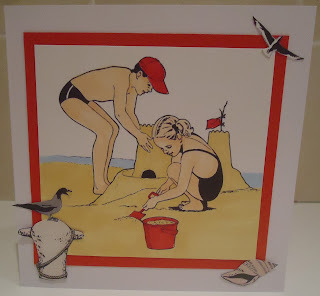 I was looking for something seaside-y to use for the CD Sunday challenge Seaside Treasures, and I found this image on a My Craft Studio CD, Setting the Scene. This picture really reminds me of those old Ladybird books , with children called 'Janet and John' or 'Susan and Peter'. I coloured them in with Promarkers and added the birds and shell, also from the CD. I'm still gathering my courage to give my son's teachers homemade thank you cards. He has four teachers - two who jobshare and two TAs. This image is from Mo's Digital Pencil and I used Promarkers, brads, Cosmo Cricket Paper and white and kraft card. Phew! 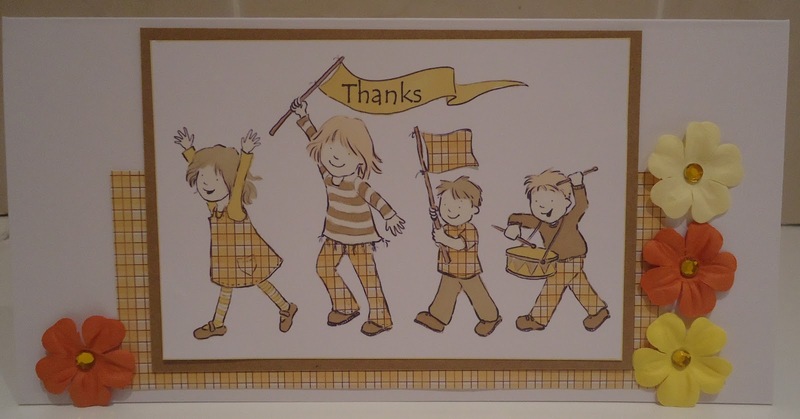 I have now completed my mission to make my teammies at work a 'thank you/ have a great summer card' each. These are the last two. 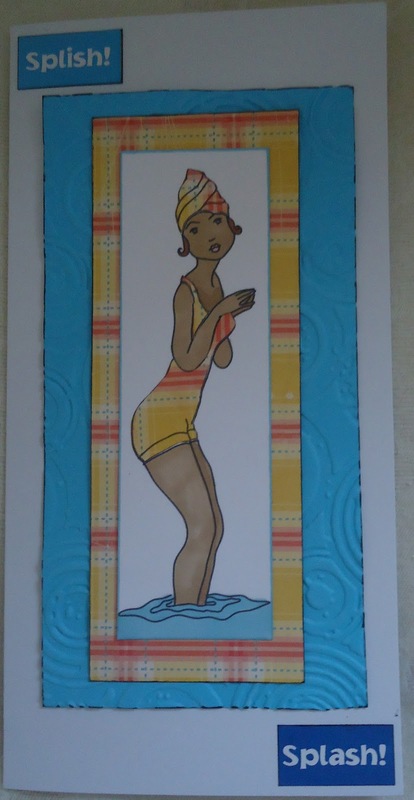 This one was made with a Sassy Cheryl digi, Promarkers, magazine freebie papers and an epoxy sticker I've had hanging around for years. This one was made with a digi from Isabella’s sketchbook. I used Promarkers, embossing folder, Cosmo Cricket paper scraps and some stickers that (guess what?) I’ve had hanging around for years! I'm still making summer cards for my colleagues. 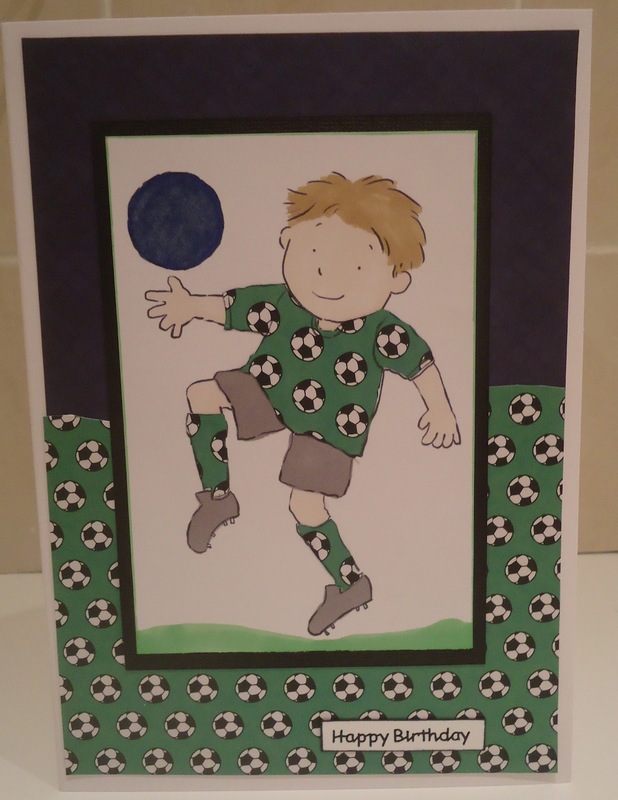 This is for one who has two little boys with similar colouring to this. 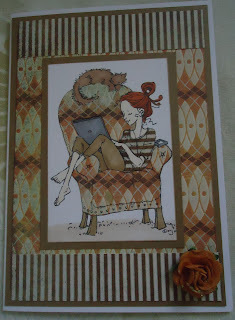 The image is from A Day for Daisies and I used kraft paper, distress ink, Promarkers and patterned paper from Cosmo Cricket. The shell is part of an UM stamp, that I cut out and stuck on with sticky pads. At the college where I work, term is now drawing to a close and people will start to take their four-week holiday from the end of this week. I'm trying to make my team some holiday-themed cards to say 'thank you and have a great break'. This is another one from Mo's Digital pencil, coloured and paper pieced. I'm not big on embellishments but considered adding some flowers, but in the end I decided it was busy enough.